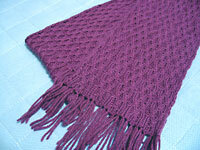 Achernar features delicate, interlocking cables worked in a sport-weight yarn. 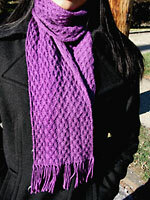 This medium-sized scarf looks great with the Shedir hat in Knitty’s breast cancer awareness mini-issue. 01/11/2009: The pattern instructions and chart have been significantly re-worked. 12/30/2006: Error in Pattern B fixed. A note on yarn substitution: This pattern looks best if it is aggressively blocked open to highlight the cables and reduce the fabric’s natural tendency to curl. When choosing a substitute yarn, make sure to choose one that can be blocked; yarns with a higher percent of acrylic may not work well for this pattern. I am confused, what do you mean ‘work knits and purls as they face you’? k the knits and p the purls or what? Yes, k the knits and p the purls. This is helpful! I can’t find any key, though, that has just T. I found tbl but can’t find just T or T2F, T2B??? What are the abbreviations T2F and T2B? T2F and T2B stand for twist 2 front and twist 2 back, respectively. What does “M1″ on row 3 of the set up ribbing mean? M1 means do a “make 1″ type of increase. Knitting Help has videos of a bunch of different M1 increases here. Started the Achernar cabled scarf… pattern #2 is no complete. What do i do? Hi Roberta, what do you mean that the pattern “isn’t complete”? Is the file corrupted and the rest of it not showing up? If so, try downloading a fresh copy.